The BBLCC Board meets monthly to plan member meetings, coordinate community outreach, and take care of business matters. Welcome to the Broadview-Bitter Lake neighborhood, one of Seattle’s best-kept secrets. 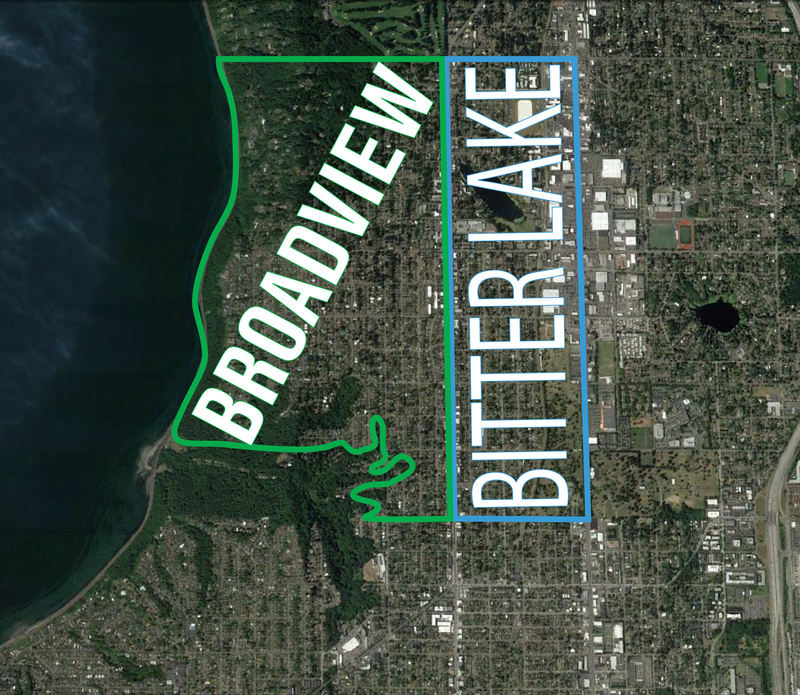 Broadview-Bitter Lake is located in the Northwest corner of Seattle, buffeted by the Puget Sound to the west and Highway 99 to the east. Our neighborhood extends north from Holman road up to 145th Avenue on the Shoreline city border. Once a heavily forested area, the Broadview-Bitter Lake neighborhood was originally home to the logging industry with mills on the shores of Bitter Lake. The Seattle-Everett Interurban trolley line ran through the heart of the neighborhood, bringing people and goods to the area and hastening its development. It was annexed in to the Seattle city limits in 1954 and remains one of the few neighborhoods in Seattle that boasts tall trees and larger residential lots, many with views of Puget Sound and the Olympic Mountains. It was once the home of the famous Playland Amusement Park and speedway racetrack, a destination entertainment center for Seattleites. This area now houses the Bitter Lake Community Center with tennis courts, ball fields, a playground, and lake access. Our neighborhood is the home of Carkeek Park, one of Seattle’s most spectacular parks with 220 acres of watershed with miles of hiking trails, a salmon spawning stream, a playground, an environmental learning center, picnic areas, and access to the Puget Sound. Additional hiking trails can be found in the Llandover Woods Greenspace, another area of old growth trees near 145th and 3rd NW. You’ll also find the Historic Dunn Gardens, a ten-acre hidden treasure tucked away off a quiet residential street. Today, Broadview-Bitter Lake is a thriving, growing community home to a diverse array of people and businesses. It is rich with natural beauty, places to worship, schools, parks, a beloved library, and community center. As Broadview-Bitter Lake grows, many who call this place “home” are eager to influence and define how the neighborhoods accommodate change. The Broadview-Bitter Lake Community Council is a volunteer network of neighbors working together to improve infrastructure, enhance walkability, address public safety, develop commercial nodes, and build a healthy community for all. All residents are welcome to join and all members can serve on our Board. Are you passionate about the future of Broadview-Bitter Lake?